World on Stage 2018 celebrates our cultures through music, dance and song. 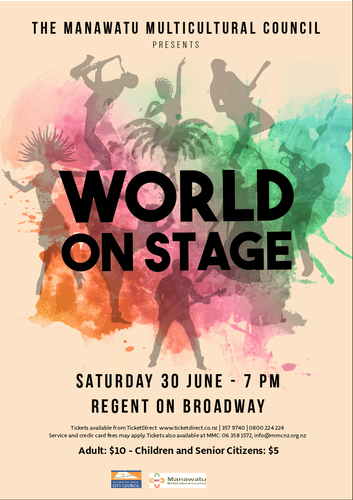 From Brazil to the Punjab, the Cook Islands to Japan, Ireland to the Philippines and much more - glittering, exciting, stylish, pulsating, we embrace the world at the beautiful Regent on Broadway. Performances, costumes and crafts, it will all be there at World on Stage. And we invite you to wear a little of your cultural heritage on this festive occasion – a scarf, a brooch, a costume, it’s time for us all to celebrate our cultures. You can’t miss this show. Brought to you by the Manawatu Multicultural Council, kindly supported by Palmerston North City Council. Tickets available from TicketDirect, the Regent on Broadway, 06 357 9740, 0800 224 224 (service and credit card fees may apply) and also available at the Manawatu Multicultural Centre.